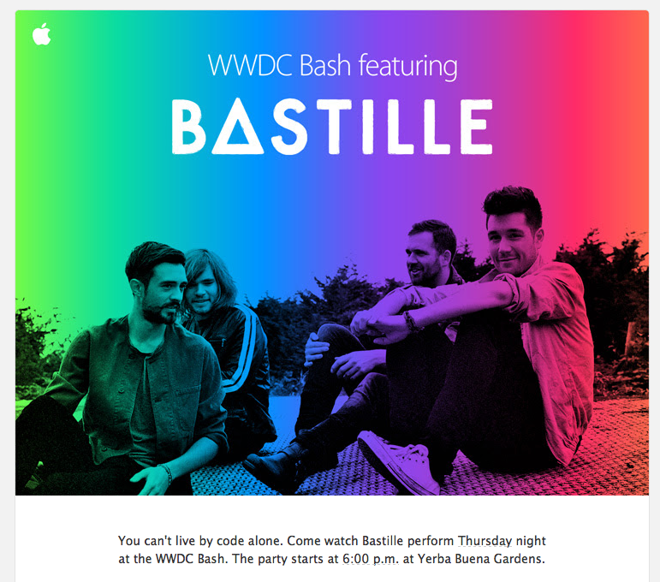 English rock band Bastille will hit San Francisco to play for developers attending Apple's Worldwide Developers Conference, with the 4-man group taking the stage on Thursday at the annual WWDC Bash. Developers began receiving invitations to the Bash, an annual party thrown by Apple in conjunction with WWDC, on Wednesday afternoon. This year's bash will be held on Thursday evening at the Yuerba Buena Gardens, a large public park in the heart of San Francisco. Apple is also giving developers promotional codes that can be redeemed for two free Bastille downloads on the iTunes Store. Best known for their current hit Pompeii, Bastille have been nominated for a number of awards including Billboard's New Artist of the Year. Last year's WWDC Bash featured a performance by Vampire Weekend.